Achieving Your Goals: Is It Worth the View From the Top? The view from almost the top. Do you ever create goals with the best of intentions but ultimately need to adjust them? How do you decide when the goal is too much? Where do you draw the line to change it? How do you know you’re not just giving up? I have a goal of publishing on this blog twice a week. Sometimes, I rock this goal – no problem. Other times (like the month of April), I don’t. I think I’m starting to figure out how to find that balance between pushing through to the top and reassessing the value of a goal. March 26th is the Colbster’s bday and I celebrated mine on April 11th. We made the decision to take a staycation to celebrate our birthdays and take some much needed down time. 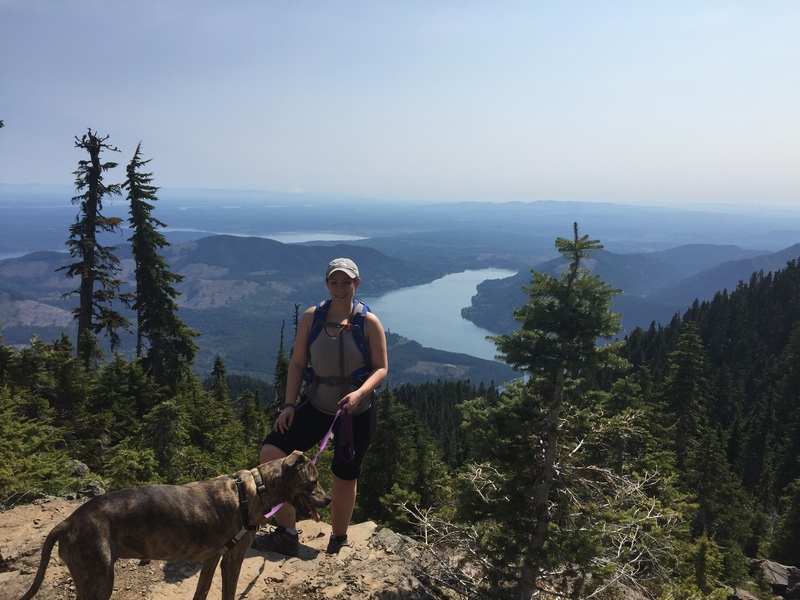 We ended up deciding to grab the pup and go hiking on the upper trail of Mt. Ellinor. It was beautiful and it was incredibly hard. While I am physically fit (I go to the gym 3-4x a week & walk A LOT) I was totally (mentally) unprepared for my first hike of the season to be this level of difficult. I am motivated by the views on a hike. If a hike is so hard that I can’t look up, it’s not worth it. I want to see sights. At the beginning of the hike, Bella was leaping and bounding up. About half way even she was slowing down but we have this goal to get to the top. My calves burned the entire climb. I could barely keep up with the Colbster who is a much better hiker than I am (plus he has super long legs so he’s faster). I stared at my feet to keep from stopping and focused on breathing so I could keep going. Goals should be set to challenge you and push you. On the flip side, goals are there to improve you, not discourage you. 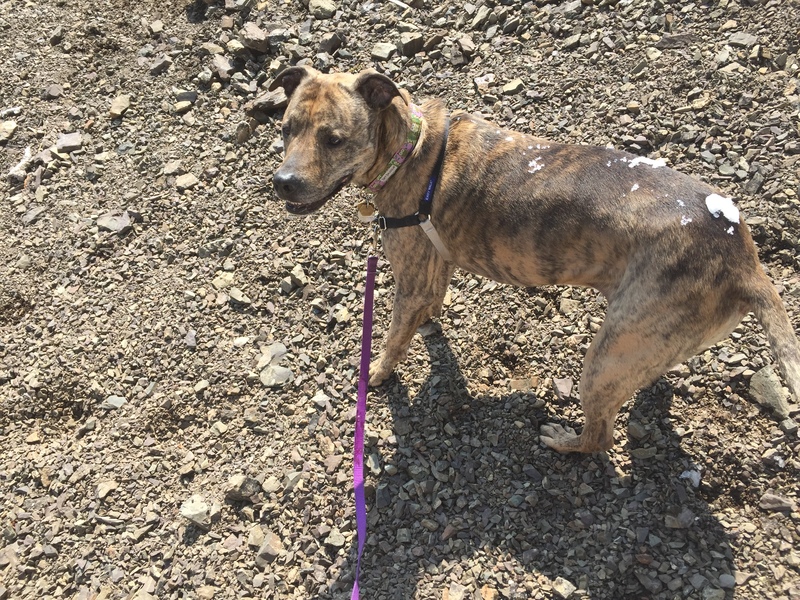 If you’re feeling like you’re pushing a rock up a hill (or a pitiful pit bull up a mountain), it might be time to reassess. Is this goal serving me? What do I gain by achieving the goal? What do I lose if I don’t achieve the goal? There came a point where I was rubbing Bella down with snow and I was actively not looking down because it made me anxious. I’m not scared of heights per say but I am worried about how easy it would be for my pup or myself to take a fall. Very close to the top, I realized I wasn’t having fun. This wasn’t the relaxing but challenging hike I was after. I was getting exercise but I was spending all this time worrying over Bella and fighting myself up a mountain. Getting to the top wasn’t worth it so I turned around and it was the right decision. Some weeks, that’s a great goal and other weeks it’s just fighting my way up a mountain for no good reason. My goal was created so that I could have a creative outlet that was all mine. I wanted to practice writing and thinking. In the last couple weeks, I’ve written on Joy’s Teaspoon and Please Advise. I’ve also generated a lot of drafts and content ideas. I’m still actively writing but publishing two times a week here isn’t feasible right now. And that’s ok. There are times where getting to the top, just isn’t worth it. There are times when hitting a goal, isn’t going to be an achievement. You have to know when the goal is more of a burden than a successful end. It’s about finding that balance. I still felt pretty good about what I have achieved. I went up the mountain. I am still writing. But my goal is adjusting as I find the balance between achievement and what’s right for me. What about you? Have you ever had a goal you didn’t hit and it was the right decision?